Golf for team of four, event signage, hole sign, recognition on school website, and Facebook, reserved table for awards dinner. 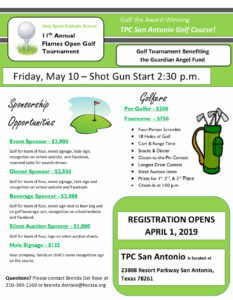 Golf for team of four, event signage, hole sign, recognition on school website, and Facebook. Golf for team of four, event sign next to beer keg and on golf beverage cart, recognition on school website and Facebook. Golf for team of four, logo on silent auction sheets. Your company, family or child’s name recognition sign on the course.